Following on from our climbing session at the Ice Factor Andy, Jarred, Richo and I headed up into Coire na Ciste today to do some more mountaineering skills training. We also climbed a soft and snowy North Gully where the fine direct start (The Gift) was sun baked ice over rock and not very appealing. Thin ice conditions on the Ben have certainly peaked and are slowly on the way out although the fatter ice lines such as Smiths and Indicator Wall could be around for a long time yet. It seemed many teams had 'fed their winter rats' as, on Easter saturday, Coire na Ciste was fairly quiet. The plateau on the other hand was absolutely hooching with folk heading up the Mountain Track from Glen Nevis. That turned out to be my last day of winter work for the varied, stormy and fairly mild season of 2007. We've had some fantastic ice high on the Ben (the best since 2002) but left many other, lower Highland hills looking a bit embarrassed at their lack of a winter coat (like the hares and Ptarmigan who's white winter plumage starkly contrasts with the brown and heathery moors). And onto the next season....I'm looking forward to a little alpine ski touring before returning to the spring rock in the Highlands and North Wales. Check our ski page for the occasional report of steep spring descents on the Ben and an update on Alpine touring conditions and log back on here next November when we'll do it all again for another 6 months - The Scottish Highland Winter. Also look out for this years BMC winter lecture series coming to a town near you in November. They will be given by Dave Hollinger and myself. What could be more quintessentially alpine than a pre-dawn, moon-lit start to a days climbing? Crunching plates of ice beneath your feet on the path. The sound of sharp crampons biting stiff melt-freeze crystals and keenly anticipating the looming icy face ahead. Steadily emerging from the dawn into a frosty but encouraging alpenglow. Starting up the face with a sociable gaggle of head torches bobbling up the Glen. Their heading this way. And why not? Conditions are perfect. Well almost. And who needs the Alps? For a few weeks anyway. THE BEN is providing a genuine alternative to the Easy Jet run to Geneva. Alpinism par excellence dans l'haute Montagne Ecosse. I had a day off guiding on the Ben today and enjoyed moving freely about the hill, climbing, watching and chatting with the many folk keen to enthuse about the weather and conditions. I finished the day on Godfrey Perroux's excellent route between Burrito's Groove and 2 Gully Buttress - J.P. is back. A little gem which I'm surprised doesn't get done more often, especially when there are 4 teams in the nearby Comb Gully! Over on a busy Indicator Wall Iain Small and Simon Richardson added a fine new 4 pitch route up the obvious rib between Riders and Albatross. Despite the excellent conditions there was a slight end of term feel with many teams eyeing up the warm sunny slabs on Carn Dearg and thoughts turning to the rock - I for one am looking forward to a lie in and spot of cragging for tomorrow at least! Overnight rain in Fort William and sea level temperatures of 3C had given fresh snow down to 400m leaving the hills looking well wintery again. Strong winds in the Allt a Mhuillin prompted an extended gearing up over tea in the CIC hut courtesy of some hospitable SMC members! Leaving the fireside for the hill seemed like the poorer option but infact the winds appeared to have eased and fleeting glimpses of a wintery Great Tower inspired Keith and I on and up. Unfortunately the forecast pleasant afternoon never materialised so we enjoyed and endured a good buffeting across the Great Tower and Gap rounded off nicely by the traditional Nevis white out Nav off! Alan Kimber and client climbed Orion Direct, still in great shape, and they appeared to have been a bit more sheltered than us. Few or no other parties had made their way up Observatory Gully, possibly not a bad thing as drifts of thigh deep soft slab at the base left us thinking it felt more than category 2. Despite another cool and frosty night in Lochaber the East Face of Aonach Mor was overwhelmed by blazing sunshine this morning - Easy Gully was a veritable sun trap that saw most folk stripping off cags as quick as you could say 'Where's all the snow on the buttresses gone?" Keith and I climbed one of the few routes in winter condition on the crag - Left Twin - quicker than you could say 'maybe we should have gone somewhere in the shade, like the North Face of Aonach Beag'. Either way the ice on Left Twin was very good despite the odd little slough coming off the scarp slopes and cornices in the sun. The Buttresses however were completely stripped down to grassy ledges and warm dry rock, the latter inspiring us to bale down the reasonable pistes and hit the almost warm and certainly dry rock in The Glen. It's perfect in the Glen at this time of year before the arrival of the dense tree canopy, not to mention the midges! Yet another classic Nevis day with cobalt skies and perfect ice - would we get tired of it if it was like this every day!? Conditions were even better than yesterday after a harder frost last night and sea level temperatures of 3C this morning. Although there were teams on many of the Observatory Gully classics Keith and I had Indicator Wall (the route) to ourselves and were able to savour the fantastic ice conditions. Graeme Ettle and Jonathon Preston repeated Simon Richardson and Iain Small's new route on Indicator Wall - Arctic Tern. This is a link between the first pitch of Albatross and last pitch of Riders and may have been climbed before as a continuation of the fascist groove start to Albatross. Blair and Murdo climbed Kellet's Route with the Augean Alley finish - which they graded at about V,3! Over on Aonach Mor Nick and Allan climbed Twin. One of the benefits, from a guiding point of view, of it being busy are doing routes that have been 'equipped' for you. Green Gully had seen a lot of traffic but was still in great shape and had the advantage of huge pre-cut belay ledges, cornices and footholds! Looking across to the Upper Cascade area a number of teams had clearly had an interesting time getting through their cornice top outs at the weekend. Le Panthere Rose appears to have touched down, Just, and is a contender for the steepest bit of climbable ice on the Ben just now. Highland Guides team Nick and Allan had a good day of skills training in the Castle area and made an ascent of South Castle Gully. Thanks to Stuart the Postie who passed on some info about the North Face of Aonach Beag. He climbed 'Stand and Deliver' yesterday at a "steep and glassy" WI4+ whilst teams on Royal Pardon found slightly cruddier conditions. Kings Ransom wasn't in. What a pleasure to see so many teams out enjoying perfect weather and conditions on nearly all of the classic Nevis Ice routes, from No 2 Gully to Stormy Petrel. The latter was climbed by Blair Fyffe and Iain Small in what may be only the 4th ascent since Cubby first made this bold journey up Indicator Wall 25 years ago. Right next door, Ian Parnell and Viv Scott repeated Blair's route Rhyme of the Ancient Mariner with a new direct start. I was out on the hill with Martin and Simon, working for Llanberris Guides. We avoided the crowds on the fine, sustained mixed and ice climb - Wendigo, a Tom Patey, Joe Brown route from the early 60's. The final cornice was far from appealing and not being of a rodent / tunneling disposition we opted for the rap, off an Abalokov, down the impressive line of 'Place your Bets' (Blyth, Perroux et al.1994) and into North Gully. Another fine day on the Ben topped by the lovely spring evening and sunset accompanying glimpes back at a very icy Nevis Nordwand. Thanks to Blair Fyffe for these photos of the Ben today and the report of, unsurprisingly, still perfect conditions. Blair and Tony climbed the best named route on the Ben, Riders on the Storm - a superb Indicator Wall VI, 5 with the highest point in the country as the final belay. Conditions on the Moores / Braithwaite route, Great Glen, were even better. See you up there this weekend! Despite a slightly mild and damp evening the reliable East Face of Aonach Mor still held good ice, frozen turf and snowy buttresses. David and I climbed a sporting Typhoon which provided some fine delicate ice climbing aswell as a good steep thrutch on the lower chimney. Apres-midi sunshine, good skiing and fine views of Nevis North Face and the Carn Mor Dearg ridges provided an unusual and welcome alpine feel which was rounded off by drinks, in the sun, on the Gondola station veranda - slainte! Good ice conditions and a cold night had a bigger effect on today than the mild thaw coming in this afternoon. David and I climbed Two-Step Corner which provided 4 Superb icy pitches following the groove line tucked in on the left side of 3 Gully Buttress. Despite some of the best ice conditions experienced since 2002 the mountain was remarkably quiet with the odd party on Tower Ridge, Green and Thompson's and with a few parties heading up Observatory Gully. Cold and snowy conditions brought Beinn Eighe into good climbing conditions for one day only. Younger and elder statesmen, Blair Fyffe and Martin Moran, took advantage and climbed the sustained summer HVS 4c, Olympus. Blair commented that it was reasonably well protected....apart from the unprotected bits....and thankfully Martin led those! 20/3/07 Winter Wonderland on Nevis. Ice, Mixed - The Lot! Today provided the first period of sustained good weather for a week here on the West Coast. The clouds drew back and dropped the curtain on an icy Nevis with the Orion Face and Observatory Gully taking centre stage. The first team I had seen on Orion this year were making good progress and were high on the route when we topped out on Tower Ridge. Teams were also seen on The Point, Green, Two Step and Ledge Route. Tower Ridge was in the most enjoyable condition I have ever climbed it in - fully hoar frosted dry rock with anything remotely ledge like liberally smothered in 'bomber' neve - a real pleasure and with views and other teams to watch we enjoyed lingering on this cold clear WINTER day! For those with the prudence to pick the right place the powder skiing could have been superb - nearly half a metre of fresh powder on a firm base in places and Nevis Range had 8 lifts open today. With Easterly winds, a large high pressure heading this way at the weekend and the massive amounts of precipitation we have had here on the West Coast - things are shaping up for a decent late season on The Ben. Snow down to valley level, strong westerly winds (gusting to nearly 100mph at one point!) and cold temperatures (-5 on the top of Aonach Mor) have brought very wintery conditions back here to the West Highlands. It's good to see the hills looking fully white again, particularly at the start of a week forecast to be cold, clear and fairly calm - quite a contrast to last week hopefully! It's been a tough week for folk on winter courses here in Lochaber. Very wet, windy and, on some days, warm, conditions have given most teams difficult decisions about where to climb. Despite this there has been some fine and sudden partings in the clouds as these shots from Aonach Mor and Buachaille Etive Mor show. Generally this weeks weather has left a much depleted snowpack on the Ridges of the Mamores and Glen Coe. As this photo shows the summit of the Buachaille yesterday was devoid of snow. However it also shows the significant remaining snowfields on the East side of the Bidean massif. Likewise Aonach Mor and the Ben have good snowcover in the corries above 900m and, with massive amounts of precipitation falling as snow on the tops, the prognosis for late season ice is good - particularly as the winds swing towards north this weekend and temperatures plummet.....fingers crossed! Significant amounts of fresh overnight snow left the Ben, Aonachs and Grey Corries looking white down to 700m again this morning. Bavarian Legal Eagles, Horst and Katarina accompanied myself on the fine horseshoe of the Corrie East of Aonach Mor (over Stob an Cul Choire, 1068m). We found good winter mountaineering and skiing conditions with up to 20cms of powder, or soft slab, on a firm base. This rarely done but excellent short mountaineering traverse finishes up the steep East ridge of the summit of Aonach Mor, at grade I. Weather conditions on the plateau were worse than forecast and provided us with a good buffeting and some exacting navigation training! Freezing levels of up to 2200m and heavy rain on the tops has stripped Glen Coe of its fine recently developed winter covering. The major thaw had even defrosted the turf up high and parties on the Dorsalgrat found unfrozen turf and very loose rock - poor conditions indeed! Les and I climbed through the waterfalls on Gear Aonach's Zig Zags and traversed Stob Coire Nan Lochain via an ascent of Broad Gully which had a fine set of steps in soft wet snow. This afternoon did seem a little cooler and it was snowing lightly on a stiff south westerly as we left the corrie. Overnight snow and todays cool temperatures left the Northern Cairngorms looking, and feeling, particularly wintery. Lightly frosted buttresses, fresh snow on ledges, bomber turf and neve gave fine winter climbing conditions and the teams we spoke to had been enjoying the good conditions on Red Gully and Invernookie. Les and I did some winter skills training in Sneachda and moved up onto the Fiacaill which provided fine winter scrambling, albeit in a stiff westerly breeze. Mixed climbing conditions across in Lochain looked excellent too. A large amount of fresh overnight snow on a stiff South Westerly wind has left the hills looking very wintery again and has left large deposits of fresh windblown snow high on North through to East aspects and justifying a category 4 avalanche hazard here in Lochaber today. There were many teams still out on the hill, exercising careful choice and getting routes done, in good or superb conditions. Guided parties climbed Tower Ridge (with Alan Kimber and client enjoying fine conditions on the WESTERN traverse of the Great TOwer), North East Buttress, Ledge Route and the fine combination of the start of Two Step Corner with the direct finish to 3 Gully Buttress. Diana and Two Step itself were also climbed. Other teams were seen on Number 5 Gully and heading up Observatory Gully - possibly not the best route choices considering the snow conditions and fresh debris was noted at the base of both of these areas. Across in the Mamores - the overnight snow and continuing reasonably cool temperatures left the hills looking superbly white and the most wintery they have been since November! Danny Goodwin and client climbed the West Face of Aonach Mor via 'Golden Oldie' which was in fine shape and a good route choice considering the recent prevailing winds. Considering the amount of snow and ice already high up on the Ben and the continuing wintery forecasts with further precipitation it's looking good for those superb late season ice conditions Nevis is rightly famous for....and the hills tend to be quiet then too! 4/3/07 Wild Wild West - Coire Leis, Ben Nevis and the Ice Factor! The Meteo lived up to it's foul predictions today and, if anything, the ferocious winds kicked in earlier than anticipated. The Ben had clearly had a rough saturday night and was in a venomous mood this sunday morning. I was working for the Ice Factor with Bex and Ian who boldy battled up into the clag and spindrifts that kicked in just above the hut. Talking was barely an option, never mind climbing, and a hasty retreat was beat to enjoy the fine steep icy walls, (always in good condition!) At the Ice Factor. The Coire Cas Park was buzzing with the arrival of excited skiers for a change - and the climbing looked pretty promising too. It didn't disappoint and Paul, Hannah and I climbed fluted Buttress Direct in superb conditions. A little fresh snow, a decent frost, frozen turf and some neve - a mixed climbing treat. Nearly all the routes in the corrie seemed in condition and views across into Avon and Etchacan revealed fairly good looking conditions over there too. Back across in the West, the organisers of the Fort William Mountain Festival had arranged the final night dream ticket of Jimmy Marshall, Hamish MacInnes and Yvonne Chouinard on the same stage, with the question and answer session hosted by Dave Macleod. One line highlights were Chouinard's description of Dry-Tooling as 'something High school kids without a girlfriend did!' Marshall showed a photo of an upturned camper van in the snow and commented him and big Ellie had cursed it as it passed them on one of their epic 19 hour hitches to the hills! Marshall commented he was glad he started climbing when he did - in a primitive stage of climbing gear development when you didn't have to worry about all the 'modern crap'! On a more frustrating note, Robin Campbell confirmed his status as an old fart by asking Marshall how many more "honest" ascents of his and Smith's great Nevis classics had taken place. Marshall seemed as bemused by this as many others in the crowd and MacInnes suggested that there had infact been a number of stepcutting repeats by Edinburgh Uni students. Is Campbell suggesting all subsequent ice climbers have been "dishonest" in some way? Surely one of the great things about Scottish Winter climbing is that it has been, and still is, evolving to encompass new styles, techniques and equipment. Scotland is extremely lucky to have an ambassador to the sport like Dave Macleod and Campbell would have done better to point out Macleod's current world-class achievements are as exciting and groundbreaking now as Smith and Marshall's were nearly fifty years ago. 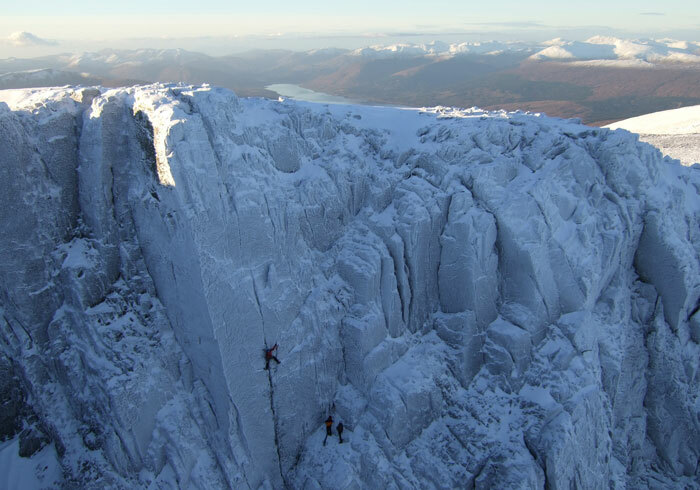 Friday March 2 - Excellent Ice and mixed climbing conditions in the Highlands (there's even some skiing!). After a lively night celebrating the last night of the international winter meet various dedicated parties cleared bleary eyes to venture back in to The Ben and Northern Corries where conditions had been excellent. Sub-zero temperatures in Glenmore, blue skies and snow and frost in the corries promised another great day for winter climbing - and much improved potential for skiing too. Creag Meagaidh now has a much finer winter coat on display, so hopefully the ice will be building again there. Thursday 2nd March - Mixed climbing extravaganza in Coire na Ciste, Ben Nevis - 3 New grade VIII's on the Ben? Another day of good conditions on the Ben saw more early bus loads of international teams heading west out of Glenmore. Never before had I witnessed so many teams on both interesting and new mixed ground in Coire na Ciste. Es Tressider, Sam Loveday and their international guests climbed the brilliant 'Stringfellow' VI,6 above the Garadh - which lived up to it's 3 star status. Dave Macleod with the strong visiting Japanese team, Mano and Taka, climbed a new line high on the Left side of Tower Face of the Comb and parallel to 'The Good Groove' at a steep and reportedly slightly loose grade VIII. Ian Parnell and partner appeared to be climbing a new line on the Sioux Wall area of 3 gully buttress and Vivian Scott, accompanied by a fairly wide eyed guest, climbed a steep and technical chimney left of South Gully at a scary VIII,8 - yet another great effort inspired by the fantastic enthusiasm for Scottish Winter climbing displayed on this meet - from guests and hosts alike. Tuesday and Wednesday - Category 4 and 5 avalanche hazard, 80mph winds and various interntaional colds give perfect conditions for rest days! Whilst a few hardy souls braved difficult mountain conditions to climb routes such as No Blue Skies, Bulgy, Ventilator, Savage Slit, Haston Line most folk were content to have a day or two off. Bouldering teams went out to Cummingston and Dave Macleod took a keen group to Newtyle to try 'Fast and Furious'. Dave re-climbed the line as an impressive first outing for his tools of the season and found many of the old pick holes had blown and been replaced with new ones at a similar grade. Mano took a fairly spectacular lob at one point, sweeping a rucksack on the floor with his head! Be careful when clipping on Fast and Furious. Folk who had been studying recent conditions and picked up a forecast who thought they were in for a fine but quiet monday morning on the Ben were in for a shock. Ice conditions were excellent high up but the arrival of around 50 of us from the winter meet meant the Ben would be anything but quiet. There was a certain 'Storming the Bastile' feel as the Barbarian hordes flooded up Observatory Gully - but there was plenty of ice, blue skies and sub-zero temperatures giving smiles all round and the hosts feeling justifiably proud of the Ben putting on a great show for the guests. I was fortunate enough to be climbing again with Mano, Taka and Pete Rowlands and it was a pleasure and a privilege for us to show them one of the finer sides of Scottish Winter Climbing. We climbed the superb and icy 'Albatross' and Mano led the final pitch to belay on the summit trig point. With perfect winter views in all directions could there be a better introduction to Nevis? Mano showed his talent and enthusiasm by simply climbing untill he ran out of rope 60m up the route having done the crux and first 2 pitches in a oner! Now downgraded to VI,5 Albatross represents the harder end of that grade on the Ben and, in 'normal' conditions is a much tougher proposition than similarly graded routes such as Astral Highway, Slav Route and Psychedelic Wall. Ian Parnell and John Varco, with partners from the International meet made the 3rd and 4th ascents of 'Babylon', Simon Richardson and Chris Cartwrights VII,8, high on 3 Gully Buttress and right of Gargoyle Wall. Es Trsesidder and Slovenian Rok Zalokar, watched by the muttering hordes on the other side of 3 Gully, added the 'Rok of Ages' finish to Gargoyle Wall at a spicy and icy mixed VII,7 - Good effort! Other teams enjoyed excellent ice and mixed conditions on Smiths Route, Point Five, Indicator Wall, Psychedelic Wall, Tower Ridge, Slab Climb, Diana, Two-Step Corner, Thompson's, Green Gully, The White Line, Glover's Chimney, The Cascade and the list goes on. The first day of the international meet was hosted by a wet, but suprisingly still quite wintery Northern Cairngorms. I was lucky enough to be teamed up with the Japanese contingent of the meet, Hiroyoshi Manome and Katsutaka Yokoyama - or, more conveniently on those shouted inter-belay winter conversations - Mano and Taka! I asked them if they had done much mixed climbing to which they modestly replied 'only a little'. This turned out to be a little bit on big walls in Alaska, a little bit on new routes in the Gangotri Himalaya (Meru Sharks Fin), a little bit of new routeing in the Andes and little bit on the fine looking icey mixed climbing they have in Japan (brief photo article on this to follow...) All in all - a lot! We 'warmed up' (actually cooled down on the wet and slushy) Overseer Direct in Coire an Lochain and also climbed Invernookie and The Message. Despite fairly unpleasant weather and conditions the two Japanese lads and many other member of the meet got some kind of idea for the style of mixed climbing on offer here in the Highlands. Despite slightly warmer temperatures and a mild thaw on the North Face of the Ben, ice conditions remain excellent high up. Numerous teams headed up Observatory Gully today whilst the Ciste was much quieter than the weekend. Tim Blakemore climbed the Cascade in fine conditions and rapped off a good rock anchor at the top. Stan and I climbed Comb Gully in extremely pleasing, sticky snow ice conditions - a real Nevis treat for the visiting American! The very small cornice was passed easily on the right on perfect neve - Aonach Mor please take note! These two photos tell the tale of a day of two halves - or more to the point, two seasons. Fiona and I enjoyed some rock climbing and mountaineering training on the North Buttress of Buachaille Etive Mor before getting into winter mode for scrambling to the summit and Navigating off in the clag. All the buttresses in Glen Coe are completely black and decent snow cover only remains in the major gullies and corrie back walls.....Not great, but winter will be back to the Coe soon! The Comb - 3 Gully Buttress 18/2/07 Fiona tops out on Green Gully Alan Hinkes using 'advanced' snow belaying technique at the top of Green Gully!! Fiona and I climbed the Nevis classic, 'Green Gully'....in superb conditions - toffee snow ice on the easier sections and sticky blue ice on the steeper pitches. The 8000m man seems to be following us around the crags and good to see he had his helmet today - interesting snow belaying techniques seen here at the top of Green Gully - clearly once you have climbed all the 8000m peaks you don't have to bother digging bucket seats or burying axes! Perhaps the busiest day of the winter so far saw many teams queuing for routes at Aonach Mor. Fortunately many of the classic ice lines were complete and the turf, mainly, well frozen. Fiona and I escaped the crowds on 2 good ice pitches on the far right of the crag, pictured here. Both provided fine short, steep icy outings at around III/IV with the right hand one giving better climbing. Numerous teams struggled on heavily corniced exits from steep scarp slopes with at least one fall and another top rope evacuation - one of the less friendly features of climbing at Aonach Mor! One climber at the crag today, making a late in the day ascent of Left Twin, had climbed all the 14, 8000m peaks, which narrows it down a bit! Shame he had to borrow my helmet though! Considerable overnight snow above about 850m on a SW wind had left the high crags of Glen Coe looking pristine again. It would have been a fine day for fresh tracks on the skis - for those with the determination to carry them in! Significant fresh cornices had built and were continuing to grow on moderate SW winds drifting some snow. Generally any exposed turf was well frozen and the mixed climbing conditions were good. Further North at Aonach Mor a number of cornice collapses and slab releases warranted a solid category IV avalanche grade! I was out on the hill with a Plas-y-Brenin winter mountaineering group completing a fine traverse of Stob Coire Nan Lochan - Another good day on the hill. The talented and youthful team of Blair Fyffe and Steve Ashowrth have made a winter ascent of the Ben Nevis HVS 5a Knuckleduster. Situated on the left side of the steep 3 Gully Buttress this intimidating line had repelled other strong parties - on one occassion, with serious consequences. Steve and Blair described the climbing as high quality, varied, sustained and HARD!....and gave a tentative grading of VIII,9. Steve commented the climbing on Knuckleduster was certainly harder than Unicorn and much harder than the neighbouring Cornucopia - which he did recently. The short second pitch, 5a in summer, provided the crux with a strenuous rising traverse across a steep wall followed by a hard pull onto the overhung belay. Winter Knuckleduster becomes another fine addition to the recent collection of hard mixed routes on the Ben - and is probably one of the trickiest....Good effort boys! A misty and fairly mild day on the Ben saw the isotherm rise to around 300m higher than predicted 9more like 1200m than 900m). At 900m in coire Leis the snow was extremely wet and soft and it was not untill the summit slopes that things finally frosted up. Despite poor visibility it was clear there was quite a bit of ice at the base, at least, of the little Brenva Face. Our mountaineering group enjoyed a fine, calm and, increasingly, quite mild day on the East side of Aonach Mor where there were many teams out winter skills training. The winds shifted from SE to NW as the day went on and a few new deposits of fresh windslab were noted on aspects from NW right round to E.
Ice conditions lower down on Ben Nevis are improving as the freezing level moves up and down the north face. Compression Crack suddenly appeared very icy and, as the photo shows, ice was building on The Curtain again after it was stripped completely by the recent thaws. After the early morning very windy weather sent many teams down again things calmed down and we enjoyed an excellent 'ecole de glace' day on the small crags in Coire na Ciste. Highland Guides team Mike Cooke and Mike Brownlow cruised quickly up Ledge Route and traversed a windless plateau to descend No.4 Gully. Extremely strong winds in Lochaber saw many teams heading back down off the hill for a very early bath. This was not a bad decision as the wind showed no sign of relenting as the day went on. We climbed 3 pitches of the Buchaille's excellent North Buttress which provided good frosted up rock climbing. A slightly wilder day than expected was experienced high on the Lochaber tops. Descending Easy Gully was done for many teams in a maelstrom of gusting spindrift and those who had omitted their goggles after recent 'beau temps' had a hard time! Some teams retreated at this point and others were left wondering - with all this snow blowing about - is it really a category 1 day? Jerry made an excellent job of his first ever winter lead - turning the crux first pitch of 'Forgotten Twin' (II) into a clip up (with 4 ice-screw placements!) and keeping a cool steady head on the more run out 2nd pitch. We also climbed Left Twin which was in good shape- with lots of good foot ledges! White Shark and Tinsel Town? also received ascents. Today - friday 9/2 - is another cool, clear winter day in the outdoor capital of the UK. Another superb day in Lochaber, with sub-sero temperatures at sea-level, wall to wall sunshine and lots of ice high on the Ben. Lots of folk were on the hill enjoying the good conditions on many of the high classics from Pyschedelic and Indicator Wall to Comb and Green Gully. Jerry and I avoided the crowds on a superb direct start to Raeburn's Easy Route and continued up that route on excellent snow ice. Good to see Stuart the Postie and Stuart from Comrie on the hill - having done Caledonia and Smiths in good shape. Jerry and I avoided the crowds on Icicle Gully which gave 3 good pitches including a rather delicate and hollow crux chimney on the 2nd pitch. Quite poorly protected and tricky for grade III! A freezing level well below the top of the Gondola gave a cool day with good stiff snow conditions on Aonach Mor. Although the buttresses are generally fairly black and much ice has gone of the thinner lines, such as Typhoon, there is still some good ice about. Parties were seen on Jet Stream, Left Twin and White Shark and all reported good ice. Glen Shiel and Skye both have limited snow although there were some decent patches in Glen Shiel for snowcraft training. On sunday we climbed the fine NW ridge of Bruach na Frithe in rather slippery summer conditions. A reasonably cool night in Lochaber has improved the ice climbing conditions on Ben Nevis and Aonach Mor. Although, as this photo shows, the general snow cover is much depleted there is still a good base high on N-E aspects and in sheltered gullies. With a freezing level of 800-900m forecast for the weekend the high sheltered gullies on Ben Nevis should still give some good sport. Yesterday was very mild and a good day to check out Scott Muir's excellent dry tooling venue at Newtyle Quarry. Sea level temperatures of 10C in Fort William today continue to reduce the exisiting snowpack. There is still good cover on sheltered North and Easterly aspects above 900m but away from those areas it is looking a bit spring like! The photo sums today up - A bit driech, not much snow on the hill but a lot of water in the burn! Excellent Mountain Biking conditions....there's always something good to do in the outdoor capital of the UK! "Just got back last night from Cogne. It was great. We timed it just right. It had snowed the day before we arrived and then it got extremely cold from Wednesday onwards (down to –18 overnight in Lillaz) which brought the falls in quite quickly. Some weren’t formed at all, but others were growing by metres in width and depth everyday. We mainly climbed in the Valeille valley as it seemed less busy there and we could walk straight from the house. Les Nigritelles, where we staying, was excellent. Rather plush for our standards – about twice as big as your alpine apartment last year just for the two of us and you get a huge breakfast everyday. Superb, can recommend it. We did Patri, Candelabro del Coyote, Pattinagio Artistico, a bit of E tutto relativo (top wasn’t formed), Vertigine Porcellana, Grand Val ( right hand). Apart from Patri, they were all a bit thinner or steeper then usually as it really had been thawing like mad before we arrived (a couple of our friends had been there a few days earlier already and it was quite amazing to compare the pictures! Anyways, great fun & the pizza and cappucinos in Cogne definitely lived up to their reputation." Last nights rain and mild temperatures, with a thaw at all levels, has had a major effect on climbing conditions in the N. Cairngorms. The light hoar frost on dry rock had been presenting ideal conditions for harder mixed climbing. By this morning the visible buttresses were completely black and numerous teams were seen walking back out very early in the day. Other teams persisted with very wet and slushy ice routes - from The Runnel to this line right of the waterfall of Mirror Direct. Fingers tightly crossed for a freeze - and quick! Aye - it's great on the Ben. Did Point Five on Saturday. Been waiting years to do it, because all my normal climbing partners have done it before and there are so many other great routes to do on the Ben that are new to both in the team. This time I was with a more recent initiant to winter climbing, hence the opportunity. Still required an early start mind - 4.40am departure from N Face Car park - but first in the headtorch trail tothe routes (beating the CIC crowd and campers out). Never seen so much riming around Point Five and Hadrians Wall. Rained lightly, so we and all our gear ended up ice glazed like N. Atlantic prawns. No idea what other folk got up to as we topped out early and beat a sodden retreat, and the vis was pretty poor, although we saw people complete Hadrians and saw a party on Obs. Ridge. Todays mild and misty weather did soften the snow pack but did not deter many teams from enjoying the continuing good ice conditions on Ben Nevis. This photo of the Shroud from the route we climbed, Castle Ridge (good sport), shows the ice hanging on despite the continuing thaw. Other ice lines such as the Curtain and Mega Route X are visible and although still not really in condition are at least in evidence. We descended No 4 Gully which was steep at the top but well banked out with soft snow. Many teams climbed Green Gully and parties were seen on Glovers Chimney, Thompson's Route, 3 Gully Buttress and Point Five. Good winter climbing and reasonable skiing conditions continue on Aonach Mor with plenty of ice, frozen turf and rimed buttresses. Today's slight thaw softened the snowpack but had little effect on the large cornices or on climbing conditions in general. Ricky, Norrie and I climbed Typhoon and Siamese Twin today which both provided good long sustained icy pitches at grade III and IV respectively. Morwind, Turf Walk, White Shark and Man Eater were all also climbed and reported to be in good icy nick. Skiing conditions are also reasonably good with extensive cover in the back corries albeit fairly soft snow with current freezing levels around 1000m. Weather permitting the braveheart tow will open this weekend. "We climbed Two step Corner yesterday yesterday but the weather was so minging we didn't get the camera out. You could also mention that the cornices were massive. Everywhere. Could do with a wee thaw to drop a few of them babies. There was a lot of avalanche debris below No 5 aswell so I think there may have been some came down overnight on Friday/Saturday when there was a thaw on. The top pitch on two step was cracking - a couple of steeper bulges then a bit of an icicle a la smiths icicle to top out on the pitch in the obligatory spindrift avalanche. Good rock belay at the top of it which is good as the mental crux was the cornice. At least grade V in its own right - 80 degree snow ice with nothing decent for axes - just arms and axes plunged horizontally and footholds that may or may not hold. Bit like what I imagine the top-out on Cerro Torro must be like - without the 1500m of sheer granite below it! But its looking like it might be a bumper year on the Ben now year on the Ben now - snow ice is building already and lots of things are almost in." Amen to that! My alpine stint is over for the rest of the winter so tune in here for the latest in Scottish winter reports, including a report from the BMC international winter meet at Glenmore Lodge in Feb. If you have any info. to send in please email it to me at rob@highlandguides.com and I'll put it up on these pages - Scotland, Alps or further afield. 30/11/06 Great conditions in Lochaber - For Paddlers! Torrential rain with strong and warm westerlies have affected the West Coast over the last couple of days. It's 11C in Fort William today....and the rivers are absolutely hooching! Unfortunately the snow line has been steadily rising and this glimpse of Aonach Mor in a brief parting of the clouds shows 'The Goose' (main ski bowl area) to be much depleted. A shame as it looked liked there was enough for the odd weekends skiing before christmas. Remarkably, despite the hurricane force winds and torrential rain at all levels, folk are still going up the Ben - with varying degrees of success! Wednesday proved to be a lull between two stormy fronts and gave the N. Cairngorms a fine, cool and calm day. Nick Carter and I climbed this brilliant mixed route which was liberally covered in verglass. The main 'magic crack' pitch provides a very sustained and well protected exercise in axe torqueing and precise crampon work. Many other parties (including one skier!) were out in the corrie giving a good wintry atmosphere not necessarily that typical of November! Nick Carter and I climbed this fine snowed up rock route high in Coire na Ciste. Very wintery early season conditions were encountered with lots of fresh snow on the ledges, icy cracks and hoared up rock. Up to 50cms of fresh snow had to be waded through to get to the route and fresh avalanche debris was seen in No.3 Gully which had a small, soft cornice on it. It was good for me to back on the Ben after missing a few winters whilst in Antarctica and the Alps - and Navving off the plateau in the dark and blizzard was a good way of getting reacquainted with an 'old friend'! Cool, frosty and icy conditions were experienced high in Coire an Lochain and teams climbed both Hoarmaster (Andy Nisbet and Martin Moran) and Hookers Corner (James Thacker and myself). A light but widespread hoar frost was overlying heavily verglassed granite and Hookers provided a fine, sustained and icy pitch - more like VI,6 than V,7. Looks like the Freezing level will be steadily rising above the tops over the weekend in which case monday could see the corries fairly black again. Hopefully a few folk will get some good hoared up rock action in before this happens - but you better be quick!